What is a naturopathic doctor? What’s the difference between an ND and MD? A licensed naturopathic doctor (ND) attends a four-year, graduate-level naturopathic medical school and is educated in all of the same basic sciences as an MD, but also studies holistic and nontoxic approaches to therapy with a strong emphasis on disease prevention and optimizing wellness. In addition to a standard medical curriculum, the naturopathic physician also studies clinical nutrition, homeopathic medicine, botanical medicine, psychology, and counseling. A naturopathic physician takes rigorous professional (basic science and clinical) board exams so that he or she may be licensed by a state or jurisdiction as a licensed Naturopathic Doctor. Health and wellness are within your reach! 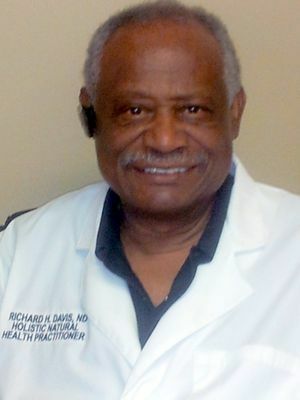 Call or email Richard H. Davis now at (678) 401-4295 for an appointment. P e rsonal nationwide holistic health concerns now available via phone counseling. I am now offering a weight loss without dieting to lose weight. who are in constant pain. Please call for appointment. Clients rate Dr. Davis highly for responsiveness, professionalism and value. prescribed medications from medical doctors that did not work at all, I decided to try a more naturalistic approach. Dr. Davis listened patiently as I told him my story and gave me suggestions using his expertise. He was nice, kind, courteous, and very knowledgeable. I took his suggestions and have never felt better.